Hosanna is quite the interesting word, in that between its roots and more modern use it can mean two very different things. Or at least they seem different. 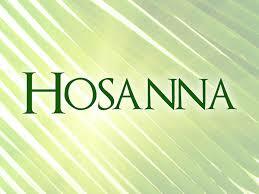 Originally, hosanna was a word used to plead for rescue or salvation. But in the time of Jesus, and today, hosanna is typically used as a shout of praise to God. Those two meanings seem very different on the surface, but when you consider that the person you cry out to for rescue, the person who saves you when you’re lost, is someone worthy of your praise…then you can see how the two meanings can make sense. But what I find most reassuring is the idea that today we don’t have to cry out to God to save us, or send someone to rescue us. Because He already has. Everything that needs to be done to save man from his sins has already been accomplished on the cross. The work is over. Now we just need to avail ourselves of that work that’s already been completed. We’re no longer shouting praise to God because we believe that He can save us. We’re shouting praise to God because He’s already saved us. Our debt has been paid, our rescuer has already come, salvation is available and waiting. And if that’s not a reason to shout praises to God, I don’t know what is. ← I try to keep good company.